Christian Sterling has a way of surprising me. The American Parable series falls outside of my typical genres/reads, but each time I open the pages to a new installation I’m sucked right back into the incredible world he’s built. 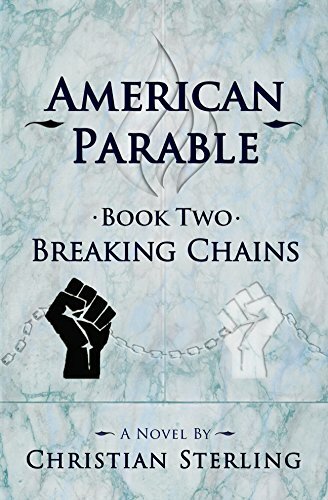 I was highly anticipating the release of Breaking Chains after the cliffhanger we were left with in Ashes and Embers. And for the love of God I CANNOT wait to find out who Kind Eyes and Dark Eyes are! The little games they’ve been playing for the entirety of the books are enthralling. In this installmentwe see our three main gangs—The Cenizas, The Young Guns, and The Revelators—team up in a way that we wouldn’t have dreamed of in the first book. The looming presence of a larger threat has them meeting and discussing allying terms as well as the necessary steps to ensure the survival of their clubs. The Revelators and The Cenizas were at a place of peace at the end of book one, so it was no surprise that the two grew closer and worked together in this book. The surprise that really shook me was the moment the two clubs came together to ally with the Young Guns as well. The Young Guns are much different than the other two gangs, because of the work they do with children in their cities. This meant that the terms of their partnership had to look a little different, and they couldn’t guarantee help in a gang battle situation. They had young lives to think about. The Young Guns were also dealing with some other issues in this book—police brutality and racism. Sterling handled this issue with grace and interspersed the serious moments with well timed humor. I was blown away by this aspect of the story. Juan Carlo, having found out about his mother’s secret love life in the first book, is thrown into a whirlwind romance of his own. “Ladies will do that to ya. All of a sudden you’re ready to trade in everythin’ that makes you a man for a quiet night at home.” I don’t want to ruin his love story, but I will tell you that he’s ready and willing to kill for Maggie. David, though, still holds rank as one of my favorite characters. He is so well written that I feel like he’s one of my oldest friends. He leads with heart and mind, and he takes care of those around him to a point that’s almost a fault. When tensions between the Big 3 and an outside source rise, the three leaders must come up with a plan to ensure the survival of their clubs. The corruption runs deep, and some strings must be pulled, but with the help of an unlikely ally they’re able to make it out of the other side—but not unscathed. Breaking Chains answers many questions, but it also leaves us with even more pressing questions. Needless to say, I cannot wait for the next installment! Christian Sterling connects all the players in his story masterfully, and the plot is never predictable. I’m looking forward to reading book three, and I want to extend a sincere thank you to Christian for sending me an ARC.